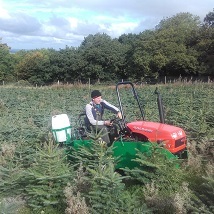 Kelleher Christmas Trees Kildare are lucky to have very good soil and growing conditions. The farm is situated in Kildare overlooking the foothills of the West Wicklow Hills. The soils are mildly acid and free-draining. Because of this, they produce slow growing bushy Christmas trees. Martin examines a 3-year-old transplant. In March when the soil has begun to dry, Martin prepares the ground for planting. He selects only the very best plants. Bareroot 3-year old seedlings are planted very carefully so that the trees get off to a good start. 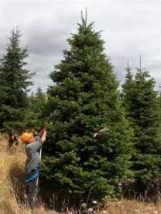 It will take at least another 8 years before the plants will exceed 2-meters in height as Christmas trees. 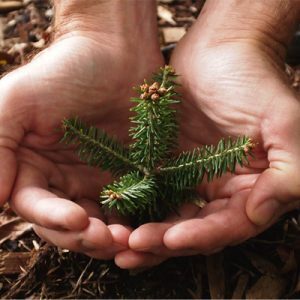 Thus, it takes a total of 11 years for a normal Christmas tree to grow from the seedling stage. Pruning Christmas trees is necessary to ensure that the trees our customers buy will fit neatly into the corner of their sitting rooms. 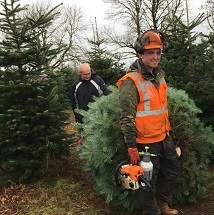 We begin pruning Christmas trees when they have been growing in the field for about six years and are more than 1 metre in height. Pruning is a skilled operation. Pruning is done in July as soon as the trees have put on their new growth. The trees that Darragh is pruning below are about 1.5 metre in height. They may be pruned again next year and subsequent years depending on when they are harvested. Christmas trees grow much more slowly than weeds. Therefore, Christmas tree growing is a constant battle between the weeds and the grower, who is trying to protect his trees. Weeds, if left to grow unhindered, would cause serious problems for Christmas tree quality. Weeds compete for nutrients and water from the soil. They shade the lower branches of the trees and cause poor needle growth and needle loss. Willowherb, brambles, nettles and gorse are the most serious weeds. Therefore, we have no option but to spray or mechanically remove these weeds. 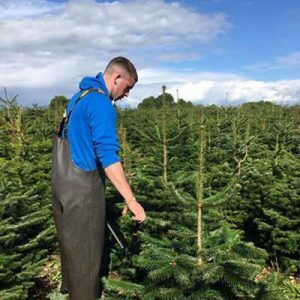 In August we begin the pleasant task of tagging and counting those Christmas trees that are suitable for our discerning customers. We only include those that are over 1.5 metre in height. The weather is normally sunny and warm and the days are long. So, it is nice to be out working among the trees. Also, our year’s work is nearly done and Christmas is not far away. Come September, our wholesale customers will be anxiously ringing up to find out how many trees we have for sale in each species and size. We need to have orders in by early October so that trucking can be organised in order to avoid disappointments. In early December, we open our farm for Choose & Cut sales. This has become very popular in the past five years. Some people come from as far away as Waterford and Athlone, but our main customers are from within a radius of 20 miles. For more information on Choose & Cut, click here. 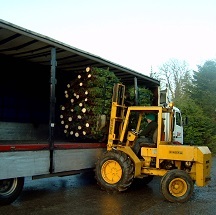 Usually in late November and early December, we cut, bale and palletize any trees destined for the wholesale market. At that time of the year, the days are short and the weather is usually cold and wet. Consequently, the work is more difficult and unpleasant than in the long warm Summer days. However, it must be done regardless of the weather or inconvenience. On-time delivery is important.